For the first time, a study using data from the 1946, 1958 and 1970 birth cohort studies has suggested that the position of grandparents in the British class system has a direct effect on which class their grandchildren belong to. It has long been accepted that parents’ social standing has a strong influence on children’s education, job prospects and earning power. However, this study by researchers from the University of Oxford and Durham University shows that even when the influence of parents has been taken into account, the odds of grandchildren going into professional or managerial occupations rather than unskilled manual occupations are at least two and a half times better if their grandparents were themselves in professional-managerial positions. This latest research finds that the social advantages and disadvantages that are transmitted across generations are a lot more durable and persistent than previously thought. It establishes a statistically significant association between grandparents’ and grandchildren’s class positions, even after the parents’ education, income and wealth (such as whether they are home owners) are taken into account. The researchers found that among men with both parents and grandparents in the professional-managerial class, 80% stayed in those advantaged positions. But among men with long-range upwardly mobile parents (i.e. grandparents in unskilled manual occupations and parents in professional-managerial occupations), only 61% managed to stay there. For women, this ‘grandparents effect’ was less strong, at 66% and 51% respectively. Where grandparents were from a high social class and the parents experienced downward social mobility, the grandparents effect appeared stronger, pushing the grandchild back up the social ladder. The study says that in such cases there was a ‘higher level of counter mobility’, as though grandparents’ class background was correcting the ‘mobility mistake’ made by the parents. 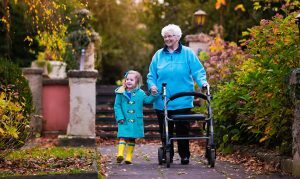 The researchers say cross-national comparative research is under way to explore whether the grandparents effect in social mobility is also found in other countries.